Welcome to day #4 of the Paper Makeup Stamps July release sneak peeks! Today is the Framed set and Word Art sneak peek day! 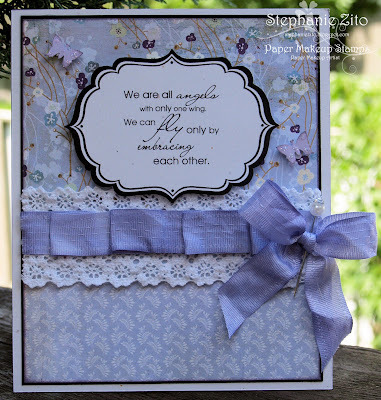 Products used on my card: Paper Makeup Stamps "Framed" set and "We Are All Angels" wordart (to be released on July 7th), Bazzill, and SU cs, BG (Wysteria) dp, u/k lace trim, Jenni Bowlin stick pin, Colorbox Chalk ink, Glimmer Mist and Seam Binding ribbon. Inspiration for my card came from this week's sketch #122 at Card Patterns! Very pretty! I love the lace and the crimpled (?) ribbon. Nice nesting too on the label. Very nice!